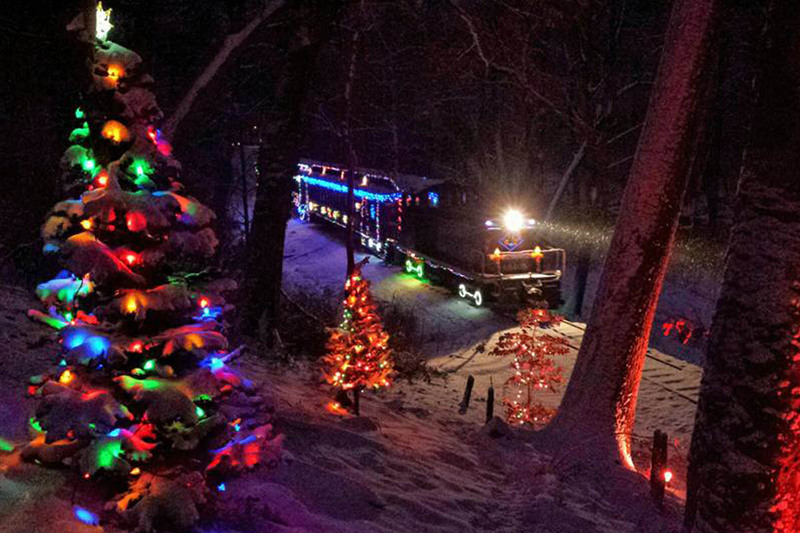 Enjoy a peaceful interlude at the end of the year with a 45-minute evening ride aboard our heated 100-year-old coaches, each of which is covered with thousands of holiday lights. Many of our trackside neighbors decorate their homes and yards for our passengers to enjoy. NOTE: This excursion does not feature a visit from Santa Claus. Santa and his elves visit children only on the Santa Claus Express. This event is powered by one of our historic first-generation diesel locomotives. HRCV Members save $2 on each ticket. What's this? Larger groups (between 25 and 40 people) can rent our Parlor Car to have a private party aboard the train. The Parlor Car is a larger space with plenty of room to set up food and beverages for your party. Learn more about renting the Parlor Car. All trains operate rain or shine. The railroad reserves the right to substitute coaches and/or motive power as operating conditions demand and to make modifications to the schedule without prior notice. We have limited accessibility for handicapped persons. All buildings have wheelchair ramps and we have a wheelchair lift to board the train at Greenbank Station. However, there is no wheelchair lift available at any of our stops, including the Mt. Cuba Picnic Grove and Hockessin. Train doorways are only 24-inches wide and there is limited space for wheelchair storage on the train. Reserved tickets (purchased either online or through our Business Office) will be held at the station ticket window and are to be picked up at the ticket window upon your arrival. Reserved tickets must be picked up at least 15 minutes prior to departure. If reserved tickets are not picked up 5 minutes prior to departure, we reserve the right to make those seats available for walk-up passengers, and your reservation will be considered "unclaimed." Unclaimed tickets are non-refundable. Requests for cancellations and/or changes to online orders must be received in our Business Office by calling 302.998.1930 at least 48 hours prior to the day of your train ride. Cancellation policies are strictly enforced. Our office is not open on Saturdays, Sundays and holidays. If you would like to add people to a reservation after making the initial reservation, please call our Business Office to have the additional people seated with your group. If you are planning to meet other families on the train and want to sit together, you can let us know when you make your reservation online. Membership in Historic Red Clay Valley Inc., (HRCV) the non-profit owner and operator of the Wilmington & Western Railroad, gives you and your family discounted fares on some of our most popular events. You can also receive discounts on Gift Shop purchases and Caboose Rentals, depending on your level of membership. Learn more about the benefits of becoming a member. Historic Red Clay Valley Inc. The mission of Historic Red Clay Valley Inc. is to preserve and interpret the natural, cultural and railroad heritage of northern Delaware, and specifically the features of the Red Clay Valley, for the education and enjoyment of the public.